The combined effects of a commercial probiotic, BetaPlus®, and a prebiotic, isomaltooligosaccharides (IMOS) on the growth, survival rate, intestinal microbiota, and hemato-immunological parameters were evaluated in Caspian brown trout (Salmo trutta caspius Kessler, 1877). Caspian brown trout fingerlings (~ 9 g) were fed a control diet (basal diet) or a synbiotic diet (the basal diet + 2 g kg−1 IMOS + 1 g kg−1 BetaPlus®) for 7 weeks. At the end of this trial, fish fed the synbiotic diet showed significant improvements in body weight increase, feed conversion ratio, and survival rate compared with fish fed the control diet (P < 0.05). In addition, fish fed the synbiotic diet had the highest levels of white blood cells, monocytes, and neutrophils (P < 0.05), while the red blood cells, hemoglobin, hematrocrit, mean corpuscular volume, and lymphocytes were significantly higher in the control group (P < 0.05). 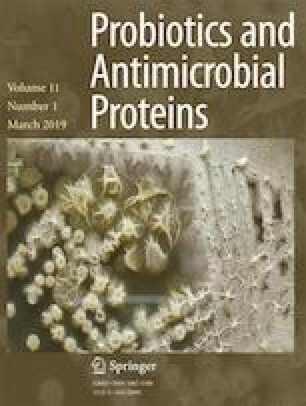 The serum triglycerides, cholesterol, total protein, albumin, albumin/globulin ratio, and immunoglobulin M levels, as well as alanine aminotransferase and lactate dehydrogenase activities were higher in the synbiotic group than in the control group (P < 0.05). In addition, fish fed the synbiotic diet showed significantly higher gut total viable aerobic bacterial counts and lactic acid bacteria (P < 0.05). The results demonstrated that BetaPlus® in combination with IMOS enhanced the growth, survival rate, intestinal microbiota, and some haemato-immunological parameters in Caspian brown trout fingerlings. The authors would like to thank M.E. Rastravan, Dr. S. Najjar Lashgari, G.R. Lashtoo Aghaei, and R. Yousefi from the CFRC in Tonekabon, Mazandaran province, Iran, for their cooperation during this research. We would also like to thank the anonymous editor and reviewers for their helpful suggestions for this study.